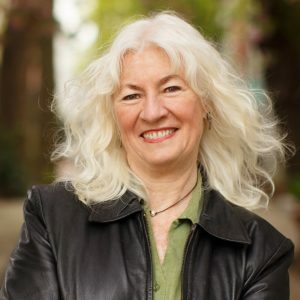 Judy Wicks is a leader, writer, and speaker in the localization movement. She began buying from local farmers in 1986 for her restaurant, White Dog Café, which she started on the first floor of her Philadelphia row house in 1983. Realizing that helping other restaurants connect with local farmers would strengthen the regional food system, she founded Fair Food Philly in 2000. The following year she co-founded BALLE, the nationwide Business Alliance for Local Living Economies and founded the local affiliate Sustainable Business Network of Greater Philadelphia, currently with over 400 members. In 2009 Wicks sold the White Dog with a unique agreement that preserves local, independent ownership and maintains sustainable business practices, including buying from local farmers, composting, and using renewable energy. Her work has earned numerous local and national awards, including the James Beard Foundation Humanitarian of the Year Award, the International Association of Culinary Professionals Humanitarian Award, and the Women Chefs and Restaurateurs Lifetime Achievement Award. Wicks was inducted into the University Science Center’s Innovators Walk of Fame in 2016. Her acclaimed memoir, Good Morning, Beautiful Business (2013), won a national gold medal for business leadership and has been translated into Chinese and Korean. Judy Wicks continues her work to build a new economy of beautiful businesses and mentors the next generation of entrepreneurs in Philadelphia. Contact Judy Wicks about speaking dates and terms.